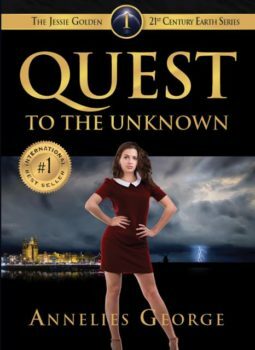 Why did I write Quest to the Unknown? It’s always very interesting to look back and discover how things emerged. When I reflect on how I arrived to write the Jessie Golden Series, with part one Quest to the Unknown recently published, I can only conclude it’s there because another book isn’t! After years of hard work on my very first project – a novel based on my encounters with men in the dynamic business world -, I dropped it overnight due to some unforeseen circumstances that requested a complete rewrite of the story. Now was it coincidence or faith that led me into a different direction…..?! Disappointed, I set the book aside, enjoying my summer holidays, totally not expecting at all that I would be back to writing again so soon. What did happen? Shortly after my return, I was overwhelmed by the remarkable life of a psychic. Inspired by these shocking facts a fiction tale popped up in my head and the Jessie Golden Series was born. At the same time I decided that the series had to reflect something relevant, two subjects that always have been top of mind, i.e., why is the world a cesspool of corruption, violence and terror and could there be a link with the increasing number of natural disasters? Since I knew from the beginning the main lines of the series, I started my research into the world of the paranormal. I encountered some peculiar things, like the fact that a number of physics I interviewed stated independently of each other that a big natural disaster will occur in the future, leading to a complete clean up of this planet. It made me wonder. Ever since I was a little child, I dreamed over and over again about a series of different disasters leading to something frightening which was never revealed in that dream. Now I never paid attention to these recurring dreams. However, in combination with the interesting Theory of Quantum Physics, I began to reflect on the matter. It even led to the Loveable Light initiative and the awareness I would like to draw on the subject. As any other author I automatically also included other autobiographical elements in the plot, among other characters noticeable in the protagonist of the series, Jessie Golden, which didn’t go unnoticed. In her pre-Alzheimer’s time my mother was so engaged in the story that she exclaimed at some point: “Why did you never introduce me to Carlos?” I had a big laugh out on that one and explained to her the character Jessie is pure fiction, despite some similarities. At present three books are finished, with two still to be completed in the series. In fact, I just started with part four, Living in destruction. To be continued! Are you interested in Annelies’ everyday life? Watch the underneath video and see how she spends her day.